Environmentalists have welcomed the creation of a new nature reserve for Amur tigers in the Russian Far East as a key step toward preserving the species. 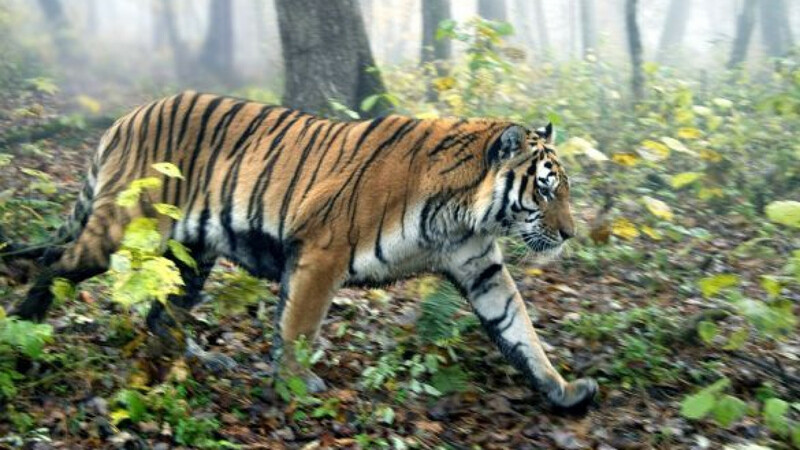 The Sredneussurissky nature reserve, which Primorye Governor Vladimir Miklushevsky signed into existence Friday, connects two existing protected areas, creating a corridor between tiger populations on either side of the Russia-China border. The 72.7-hectare reserve contains coniferous and deciduous forest along the Russia-China border in Primorye's northwestern Pozharsky district. At its southern end, it also has wetlands that host important nesting groups for storks. Yury Damn, director of WWF Russia's Amur branch, welcomed the move as an "important step" but said more has to be done. "The next thing to do is ban commercial logging in the entire Pozharsky forestry zone and hand rights to people who harvest nuts there instead," he said in e-mailed comments. Environmentalists and commercial nut harvesters have regularly clashed with logging companies over access to tiger-inhabited forest in the Far East in the past several years. About 400 Siberian, or Amur, tigers are believed to survive in the wild, mostly in Russia's Primorye and Khabarovsk regions. Conservationists say one of the most serious threats the small population faces is genetic diversity, making safe links between breeding populations critical to their survival. The new tiger territory was established as the government unveiled plans to open 30 new reserves and national parks in the next eight years as part of a federal environmental protection program, which Natural Resources and Environment Minister Sergei Donskoi announced Thursday. The 336 billion ruble ($10.9 billion) program for boosting environmental protection by 2020 will focus on four target areas: pollution reduction, biodiversity enhancement, improvement in environmental monitoring, and research projects in Antarctica. About 268 billion rubles will come from the federal budget, Donskoi said at a Cabinet meeting Thursday. While it is not clear where the remainder will come from, Donskoi did say he expected Vnesheconombank, Russian Technologies and the Skolkovo Foundation to contribute to the program by developing and commercializing resource-efficient technology. Targets set by Donskoi include reducing the number of cities with high or very high pollution by more than 60 percent and slashing the number of Russians living in unhealthy environmental conditions by 80 percent. Other goals include reducing the waste produced per unit of GDP and coming up with a conservation policy suited to deal with the impacts of climate change based on research in Antarctica. Industrial practices inherited from the Soviet era, when less than half of industry used any kind of waste-processing system, mean that 30 billion tons of unprocessed waste has been accumulated since the Soviet collapse, Donskoi said. The Natural Resources and Environment Ministry estimates that environmental damage costs Russia the equivalent of four to six percentage points of GDP annually.